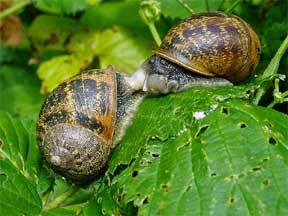 Snails will eat their way through anything they enjoy, and often nibble on plants just enough to spoil them for market. Celery is ruined in this way, when it is banked for bleaching. Other vegetables arc eaten after being stored by these snails, who like a cool, damp cellar themselves. Vegetables are not the only food they seek. Much damage is done to the flower gardens. and the commercial florist has trouble eradicating these pests. The common brown snail of our gardens is Helix aspersa. It is about 1-1/4 inches in diameter, of a round shape, and with a tan and brown shell. They come out at night to feed. The snail can live for several years sealed up inside its shell, with a sort of cement door it forms. This is loosened when warm dampness tempts it out again. Their favorite hiding spot is under boards or decaying logs, or a small pile of rocks will suit them. Science has found that a snail will return to his individual “home” each morning after foraging in a garden. Cleaning up loose boards or trash piles will help to eradicate these pests. If you have just a few in your garden, go out in the dark with a flashlight to find them. You can follow their slimy trail. Lime applied to the soil will help to discourage them. Salt will kill individuals, but also any vegetation, so do not apply it to the ground. There are poisoned baits, consisting of metaldehyde, which can be moistened and mixed with cornmeal or lettuce, etc. This may be harmful to other beneficial insects or birds, so it should be used sparingly. Does Your Garden Breed Trouble?